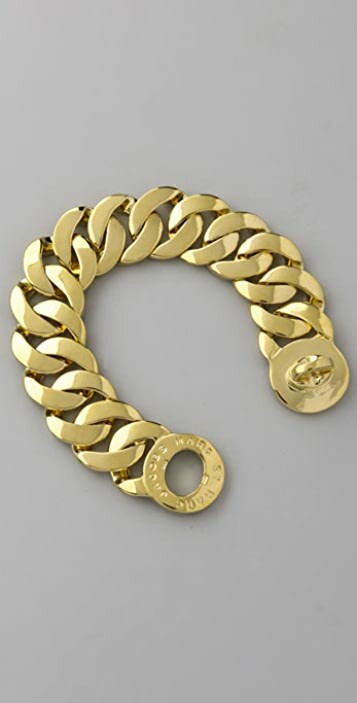 This gold-plated chain bracelet features embossed logo lettering at the turn-lock clasp. 7/8" wide. 7.25" long. I do love the aesthetics of this bracelet. It's a great accessory. However, I found that after wearing it for a month or two the gold started to rub off of the corners and expose some the metal underneath... 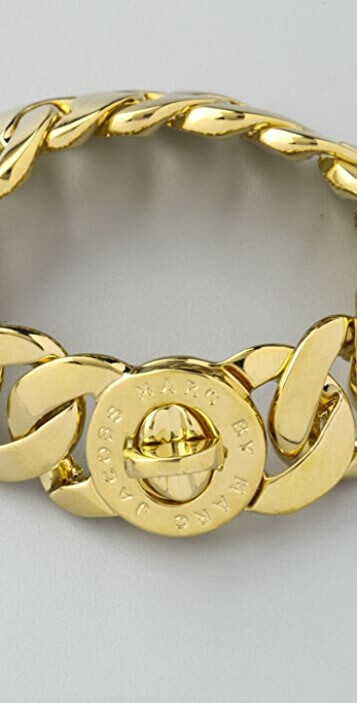 I guess that's typical of costume jewelry, but I still like to think that Marc by Marc has higher quality than that. We just looooooooooove it....bought one for myself and my sis...She was like so excited when she put it on...It fits nicely on my wrist, the weight is just right and the colour is slightly lighter than the pic. The delivery was very prompt and I will definitely shop again at Shopbop. Thanks! 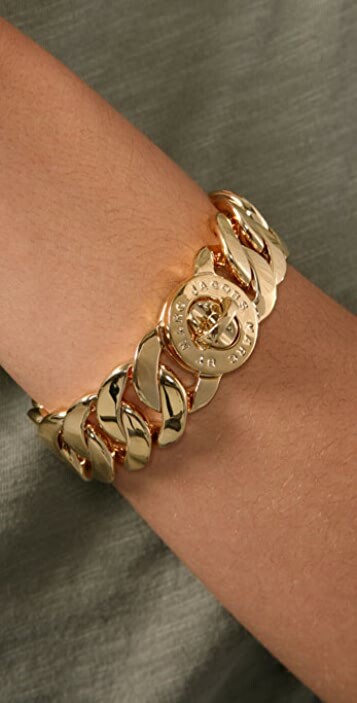 This is a beautiful bracelet, and looks just like the pictures depict it. It fits a little tight to my taste, but still sits nicely and looks great. My only complaint is that the second time I put it on, the turn lock clasp completely fell apart. Luckily I was able to retrieve the fallen pieces and put it back together (avoiding having to send it back or take it somewhere to be fixed). Unfortunately, now I will have to keep my eye on the turn lock to make sure that the little screw and spring don't fall apart again. For a piece that is this price, I would expect a little better quality. Beautiful. Very classy. A must have bracelet. I absolutely LOVE this bracelet. Good link size, nice weight to it. Looks gorgeous, my new favourite piece. I shipped this bracelet to my best-friend for her b-day, so I didn't have the chance to see it in reality prior to sending it. But when I saw it on her a few months later it looked perfect!! She's 5'6 and quite slim, it sat beautifully on her wrist, not too loose nor tight - which is what I was hoping for !! Awesome quality and beautiful craftsmanship !! She said that it looked oversized in the box, but when she put it on turned out nice. She says that she gets a lot of compliments when she wears it. People always ask where its from, so definitely its a head turner! Great buy! I definitely recommend this for yourself or a gift !! I purchased this bracelet as a gift for my sister and she (and I) absolutely loves it. The pictures accompanying the posting on this site make the bracelet appear more of a 'yellow' colour than it actually is. 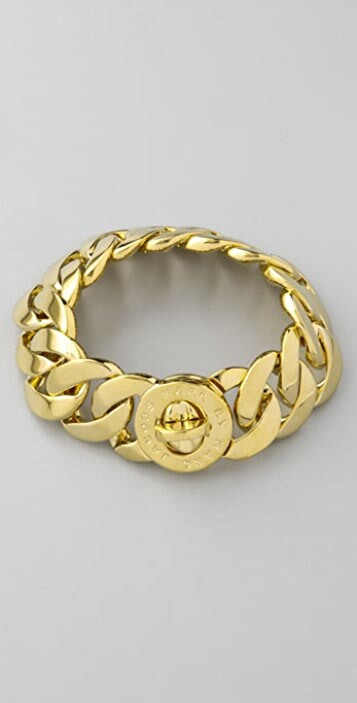 In reality it is a very nice shiny gold colour - most similar to the picture where it is worn on the wrist. Love this bracelet. The bracelet looks just like the picture. It's perfect whith every style.I feel this is a keeper!!!! The delivery was fast, as promised!